Attention tonight remains focused on Hurricane Sandy, which is currently located near the Bahamas, slowly but steadily making its way up the coast. Early next week, Sandy will strengthen while turning northwest, making landfall in the Northeast US as an abnormally strong storm with potentially historic impact across the region. Click below to read the full post for the latest analysis of Sandy. As of last night’s update, there was still uncertainty regarding where Sandy makes landfall in the region, with a likely range between the Delmarva Peninsula and New York City. There still remains some uncertainty regarding the exact track, although the potential landfall range is shrinking and a consensus appears to be emerging for a low pressure track potentially between central New Jersey and Long Island, which would place the NYC are and southern New England in the worst of this historic storm. Expected Set Up: The expected set up remains the same from yesterday’s discussion; for tonight’s discussion, the expected set up has been posted below again, although in future discussions on Sandy, the expected set up section will not be included. This is a highly anomalous set up and is the result of several factors falling into place at the right time. 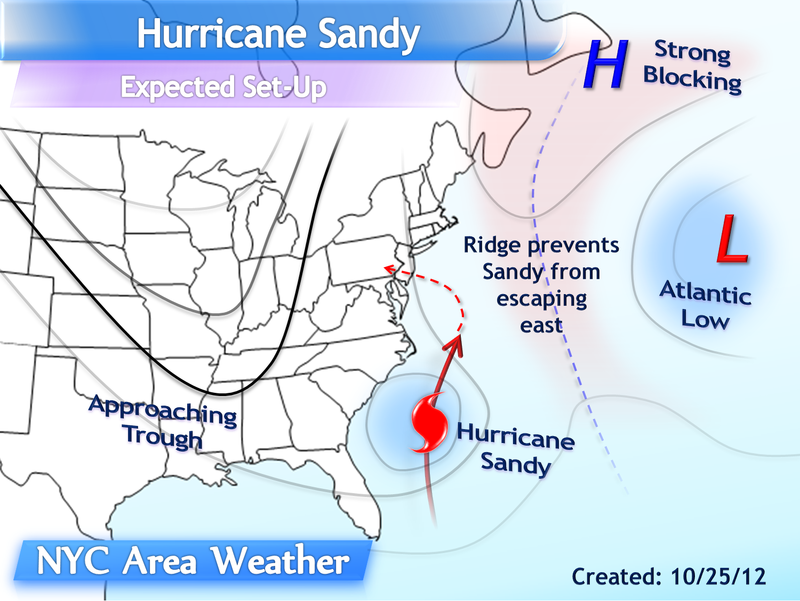 The key player to this whole storm is Hurricane Sandy, which is discussed in more details in the next section. 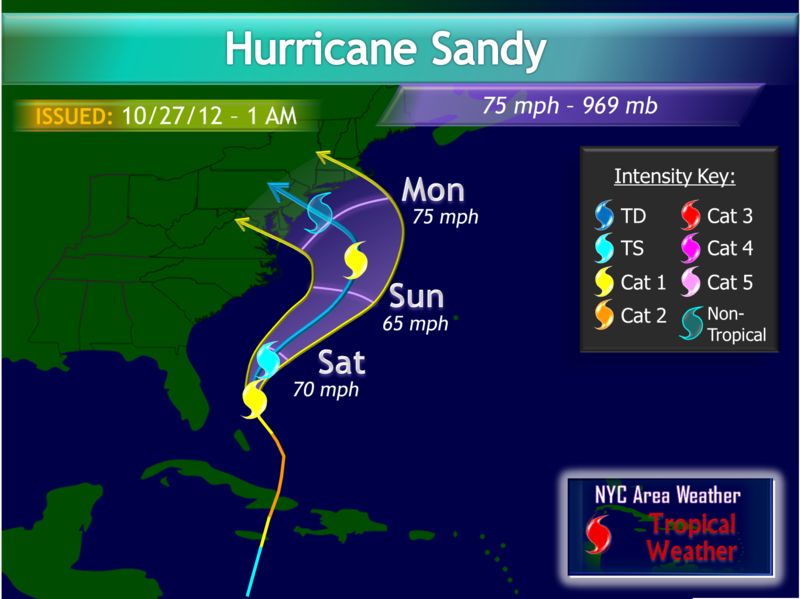 Sandy will continue to move parallel to the Southeast US coast in the short term. 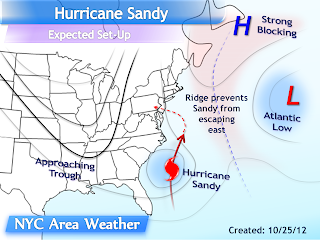 Typically, late October storms that originate in the Caribbean stay well offshore, but this will not be the case with Sandy due to an anomalous block near Greenland and Newfoundland and a cut off low pressure to its south, as ridging to the east of Sandy connecting to the northern block will prevent Sandy from escaping eastward and out to sea. Meanwhile, a strong trough will drop into the central and eastern United States, approaching the coast as it becomes negatively tilted. With Sandy blocked from moving further north and east, she will be captured by the trough and will sharply turn northwest, then WNW, retrograding into the northern Mid Atlantic region in a very unusual track for a tropical cyclone. Track Forecast: Since yesterday, the spread for the forecast track has considerably narrowed down. Earlier today, the large model spread continued and even grew in size, ranging from the 0z ECM which made landfall well to the south of the area, to the 0z CMC which took Sandy into Maine. With the afternoon model guidance, however, the range has narrowed down as the model guidance singled out the central NJ to Long Island axis. The ECM trended further north, taking Sandy into New Jersey, while the rest of the model guidance slowly trended closer to a landfall near or just south of New York City. At this time, Sandy is about 3 days, or 72 hours, away from making landfall. While the landfall zone is not final yet, there is higher confidence with tonight’s track outlook than there was with yesterday’s discussion. As a result, I shifted my forecast track further north, with a landfall potentially near central NJ, but is subject to minor revisions, with a high probability range from NYC to southern New Jersey. The general cone of uncertainty ranges from about the central Delmarva Peninsula to Cape Cod. Several changes were made to the track compared with yesterday’s outlook. The track was shifted further east when Sandy is east of the Carolinas, with a slightly sharper curve to the northwest until Sandy makes landfall in central New Jersey. The most important difference in terms of impact in the region was the speed; as discussed in the Impact section, Sandy will be faster than previously expected, and may already make landfall by Monday evening as opposed to Tuesday. Intensity Forecast: The intensity forecast for Sandy is a little more difficult to forecast than the forecast track. Sandy has been affected by persistent shear throughout the day and has continued to weaken to a 75 mph hurricane while it remains disorganized. Sandy is expected to further weaken into a tropical storm for Saturday and parts of Sunday as well, likely falling to at least a 65-70 mph tropical storm. Even though Sandy is expected to be a tropical storm, it does not mean that the danger that Sandy poses to the Mid Atlantic and Northeast is written off, as will be discussed in more details throughout this discussion. Sandy’s minimum pressure remains in the upper 960s to 970s millibar range, which is still very low for a tropical storm. As Sandy starts to turn north, then northwest as it approaches the Mid Atlantic, it will transition into a hybrid storm with an asymmetric warm core; it will contain both tropical characteristics, such as a warm core, and non-tropical characteristics. By that time, it will intensify as it interacts with and is captured by the trough, with the minimum pressure falling, and may re-intensify into a hurricane. The next question with Sandy is the minimum pressure. The models have a bias to exaggerate minimum pressures with tropical cyclones, which was evident many times in the last few years with tropical cyclones such as Leslie, Isaac, and last year’s Irene. Yesterday, some of the models were dropping Sandy’s minimum pressure into the sub-940 millibar range, although today’s runs trended slightly weaker, with the minimum pressure generally between 940 and 950 millibars on most models at its peak. At this time, a reasonable range for the lowest minimum pressure is approximately 950 to 960 millibars, more likely in the lower end of the 950s range, slightly rising as Sandy makes landfall. Even when slightly adjusting the minimum pressure from the model guidance, Sandy remains an abnormally intense cyclone, and is on track to have the lowest minimum pressure ever recorded in the region, even lower than other historic storms such as the 1938 Long Island Express. Impacts in the Northeast: Since yesterday’s update, the general track of Sandy has become clearer, although it is still subject to some changes. Regardless of exactly where Sandy makes landfall, impacts will be significant and far reaching, with the majority of the Northeast and Mid Atlantic experiencing strong to damaging winds, heavy rain with flooding, and a significant storm surge that in parts of the region will overshadow last year’s historic October snowstorm. Wind and Storm Surge: As previously mentioned, Sandy is expected to have the lowest minimum pressure on record for this region. Unlike a typical hurricane, Sandy’s strong winds will be spread out across a large radius, with the strongest wind gusts expected closer to Sandy’s center but not necessarily closest to the center. 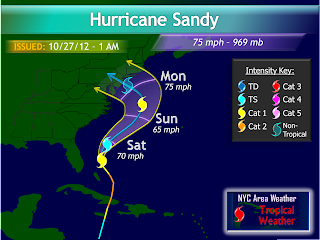 Closer to Sandy’s landfall location, wind gusts of 65 to 85 mph are likely, especially near coastal areas. In the worst case scenario, gusts above 90 mph may not be out of the question. For the rest of the region, widespread gusts between 40 and 60 mph are likely; strong wind gusts will be observed even in locations far from Sandy’s center. With the current forecast track, this would place the strongest wind gusts over the NYC area as well as coastal southern New England. Locations to the east of Sandy’s track will be exposed to strong east/SE winds with a significant storm surge expected for coastal locations. The exact range depends on where Sandy makes landfall and is subject to some revisions; should it follow a central NJ path, a significant storm surge would affect coastal New England as well as Long Island. Rainfall: Significant rain amounts are expected from Sandy as tropical moisture is pulled into the region. The highest rainfall amounts will be to the west and south of Sandy’s track, where the potential exists for generally 4 to 8 inches of rain, with some areas within that region seeing above 8-12 inches. North of the storm track, lighter rainfall amounts are expected, generally between 1 and 4 inches, although strong winds will be the main risk for these areas. Assuming Sandy makes landfall in central New Jersey, the highest rain totals would end up from the Delmarva Peninsula into Maryland, southern New Jersey and Pennsylvania. This will be a prolonged rain event, as Sandy stalls on top of the region following landfall and slowly weakens, finally exiting the region by at least Friday. Snowfall: A significant snowstorm is expected for the mountains of West Virginia as well. As cold air will be pulled to the south of Sandy, heavy precipitation will fall over areas with sub-freezing temperatures, resulting in a heavy wet snowstorm for the mountains, where at least 1 foot of snow is possible, perhaps more. Cold: Another important issue with Sandy’s impact in the region includes the cold air mass coming in behind the low. As Sandy stalls over the Northeast, much cooler temperatures are expected for eastern parts of the region including the NYC area, with lows generally in the 30s and 40s and highs in the 40s to mid 50s, while breezy conditions persist. The cold temperatures will be an issue for locations that lose power for several days without heating. Impacts in the NYC Area: As Sandy’s track range is narrowing down, there is more confidence in the overall scenario for the NYC area. Rain is expected to develop after Sunday afternoon, steadily intensifying throughout the overnight hours as wind gusts steadily increase into the 25-40 mph range as well. As mentioned in the track section of the discussion, the potential is there for Sandy to make landfall earlier than expected; the model guidance has been trending a little faster, showing at least a Monday evening or early overnight landfall as opposed to a Tuesday landfall. Assuming that Sandy makes landfall late in the day on Monday, the worst of the storm would be during the day into the evening hours as Sandy approaches landfall. Heavy rain is expected, especially west and south of NYC, with wind gusts increasing; the exact winds are uncertain, although the potential is there for widespread 50 to 75 mph gusts across the area, with higher gusts towards coastal areas above 80, possibly even 90 miles per hour. Winds and rain will gradually weaken behind Sandy as she moves inland, with occasional showers and windy conditions lasting through Tuesday and Wednesday. Temperatures will drop into at least the upper 30s to mid 40s for lows, with highs likely in the upper 40s to mid 50s. The scenario mentioned above assumes that Sandy makes landfall close to central New Jersey. The landfall location is not final just yet, and the scenario above is subject to some changes over the next 1-2 days. Summary: Sandy is shaping up to be a historic event, with widespread and significant damage across the region. There are many hazards associated with Sandy, including a significant storm surge for coastal areas, very strong damaging wind gusts, significant rainfall with flooding possible especially west and south of NYC, and high elevation significant snowfall in West Virginia. With heavy rainfall saturating the ground combined with very strong winds, widespread downed trees and power lines are likely with widespread power outages, potentially lasting for several days. The final track, however, is not certain just yet, and additional adjustments could be made to the forecast on Saturday and Sunday. Sandy will be a very dangerous and potentially life threatening storm, and should not be taken lightly. It is highly recommended that preparations be completed as soon as possible, including gathering important supplies such as food, water, batteries, flashlights, ect., as well as having an evacuation plan should it be necessary to evacuate. Stay tuned for more updates on Sandy over the next few days.